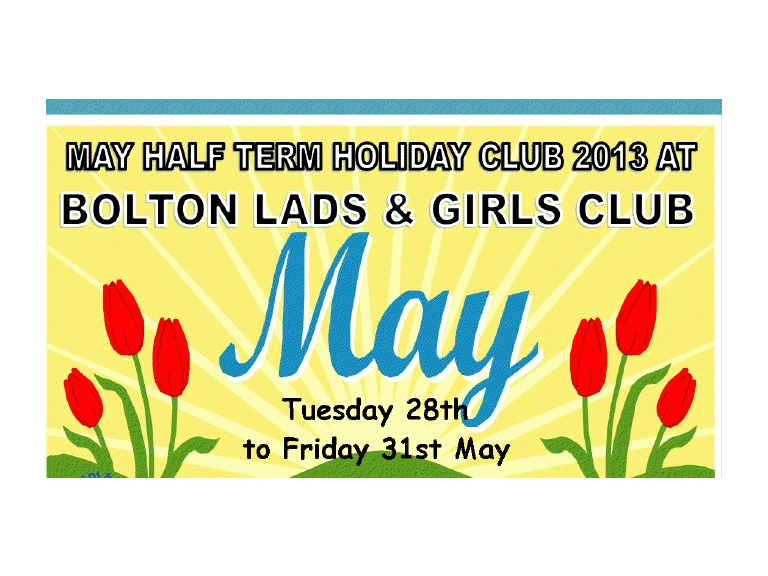 Places are filling up fast for Bolton Lads and Girls Club May Half Term holiday club. In the past 4 years an amazing 1,500 people have attended Bolton Lads and Girls Club holiday club, making it one of the most popular in Bolton. The club will be running between Tuesday 28th May and Friday 31st May for all children aged 8-12. They are closed on Monday 27th May for bank holiday. Bookings made before 26th May will be £5 if your child wants to attend between 8am-6pm, and £3 if they want to come between 11am and 6pm. This is a saving of £12 for the whole week. After the 27th May, the 8am-6pm session will be £8, and the 11am-6pm sessions will only be £6. Young people must be members of the club to attend. It is a bargain £3 a year to become a member, and this includes membership to Bolton Lads and Girls Club youth club, arts projects and sports projects. There’s always something going during the half term. Two hours a day are set aside for play sessions. Sports of one of the most popular past time of Bolton Lads and Girls Club members. The club has the facilities for all kinds of activities, including tennis, badminton, basketball, multi events and football. An experienced dance teacher tries to get to the club as much as possible, so all the ladies can take part in dance classes, and occasionally cheerleading. Children can work on their balance and stability using the sports equipment and under the supervision of trained staff. For the creative types there’s regular arts and craft workshops. Those looking for something more sedate will enjoy the computer sessions and recreation activities. It’s a really fun atmosphere, and children will make lots of new friends. There’s no danger of anyone getting bored whilst they’re there.